I am getting a 64sq yard plot in suncity for Rs 50 lakhs. These plots appartently were in dispute and registration has been done only now. There is not a single house built up in this block. Anyone having knowlege of suncity gurgaon kindly advise on this investment. I think you are talking about plots which are at foothills...at the end of the Suncity..I got a quote of 48 lacs abt a week back when I was looking for one. in which sector are these located? Suncity - Sec 54, Golf course road. I think, these plots are in F block of suncity. Could you please PM me the no. of the broker ? Also, did you find the investment worthwhile ? Is there any issue with them since they are located at the foothills ? Sent you a PM and this guy only deals in plots and quite good as well. Investing there, did not sound good to me as there are other better options available in SL3, behind scottish high school as told by my 'property consultant'. I did not visit those as I dropped the idea of buying a plot. Investing in plot seems to be a smarter move than buying an apartment (in remote areas like 8x,9x and 10x sectors) but one need to have enough cash. Circle rates in that region is 40K-50k where as asking is > 80K. GURGAON: Residents of Suncity in Sector 55 have opposed the revised plan to construct buildings in the area marked as 'undetermined (UD) use', which the developers sent to the district town planner (DTP) for approval. They alleged that the revised plan proposes to encroach upon the green belt and community parks in order to develop more residential plots in the society. When the township was built, the net planned area was 116.367 acres. The developers, however, have decided to increase the net planned area to 117.142 acres. About 0.775 acre of land was reportedly disputed and the developer couldn't acquire it when the township was built. The green belt in C, E and F blocks is earmarked for construction of plots in the revised plan, residents alleged. When TOI visited the areas, it found that the areas earmarked for construction of plots in the revised plan is a part of UD use area. It was later transformed to green belt. "Hundreds of trees will be cut down and green belts will be destroyed," said Sadhana, a resident of C Block. "The areas that have been proposed for the development of plots in the revised plan were marked as UD use. We want to urbanize the area in a proper manner now. No green belts or parks will therefore be encroached for the development of the plots," Sanjay Jain, vice-president, Suncity Projects, told TOI. "I think the authorities should either ask the developer to revise the plan so that minimum the green area is occupied or all the trees from the green belts and parks should be relocated," said Suresh Yadav, a city-based environmentalist. GURGAON: Residents of Suncity, a township in Sector 54, will meet state registrar Wazir Singh to decide on the date of the RWA elections. Residents had met chief minister Manohar Lal Khattar on Monday and requested him to resolve the matter. In August 2014, the Punjab and Haryana high court had ordered the district registrar to conduct RWA elections in the township within 3 months, after two groups claimed to be the RWA of the township. However, the residents are still waiting for the elections. "While earlier the office of district registrar was giving extensions to delay the election process, now state registrar is working hand in glove with one group of residents to delay the process. We have visited the office of state registrar multiple in Chandigarh multiple times," said Abhay Singh Punia, a resident. Presently, an ad hoc committee has been appointed by the district administrator in the township to conduct RWA elections and look into the issues faced by the residents. Residents, however, have expressed dissatisfaction with the work of ad hoc committee as well. According to the residents, the absence of an elected RWA is leading to issues such as poor road infrastructure, lack of security, inefficient power infrastructure are the major issues. "Security is in a very bad state. Last week, a man was shot dead at the gate of the township. Police later found out that only one camera was working at the gate and 3 out of 16 cameras were working in the entire township. Maintenance company doesn't seem to be answerable to residents, in absence of an active RWA," said Yukta Singh, another resident. Deputy Commissioner TL Satyaprakash told TOI, "I had taken up the matter with the state registrar so that RWA electoral list can be finalized on the decided date and elections can be conducted at the earliest." In a letter to the MCG commissioner on Saturday, the residents have urged the civic body to take over the mandatory services — such as maintenance of roads, water supply etc. — and initiate strict action against the developer. However, they said they can handle the value-added services on their own for the time being. Vaishali Sethi, a working mother, said, "The garbage and slush needs to be cleaned immediately as it rained at night." Security is another concern. "Security is a major concern as many cases of robberies and thefts have been reported last month," said Mona Sharma, a resident of F block. "On Friday, the developer withdrew the services. Suddenly, all security guards disappeared. Garbage has been lying in dustbins for two days. Roads have not been cleaned. We are living in a mess," Sharma added. Despite several attempts, the official spokesperson for Suncity remained unavailable for comment. 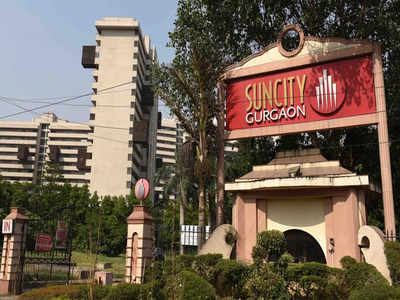 The Municipal Corporation of Gurugram (MCG) on Friday officially took over the maintenance of Suncity, a privately developed area on Golf Course Road, making it the first colony to be taken over by the civic body. The development ends more than a three-year wait since the civic body had originally been directed to take over private colonies in the city. “I visited Suncity on Thursday and found the repair work carried out by the developer to be satisfactory. All necessary documents pertaining to the layout of water supply lines, stormwater, sewer lines, roads, tubewells and electricity connection were submitted to the MCG. Subsequently, a handing over/taking over agreement was signed between MCG and the developer in the presence of local residents’ welfare association (RWA),” said Yashpal Yadav, MCG commissioner. Although the colony has been formally taken over by the MCG, residents may need to wait for a month before the civic body starts delivering services. Yadav said that the MCG is in the process of ascertaining the manpower and resources needed for maintaining amenities in Suncity, but did not divulge by when the on-ground work would be initiated. MCG officials said it is likely that the civic body would start delivering services by April 1. VMK Singh, general secretary of Suncity until recently, said, “Officially, the MCG has taken over the colony but it may be a short while before they start delivering services as they said that they are in the process of ascertaining the manpower and resources required for the colony. In the interim, the developer has agreed to continue with the services,” said Singh. The tenure of the RWA of Suncity ended on March 13 and elections are awaited. “In January 2017, the MCG was directed to take over the Suncity. After more than a two-year wait, it has finally materialised. I want the MCG to fix and add stormwater drains in the locality, as it is susceptible to waterlogging during monsoon, as run-off rainwater from the nearby Aravallis accumulates in the colony. I hope the MCG resolves this problem before the monsoon,” said Divya Surekha, a resident of Suncity. On January 9, the developer had informed the MCG that all necessary deficiencies had been fixed and Suncity was ready to be taken over by them. However, MCG officials found deficiencies in the repair work. Deficiencies included repairing of footpaths, maintenance of 16 parks, replacement of stormwater drains, sewer cleaning, and other miscellaneous work, for which a cumulative expenditure of Rs50.37 lakh was needed. On February 22, the developers deposited ?50.37 lakh with the MCG, paving the way for the civic body to take over the colony. Developers of DLF Phases 1, 2-3 are still carrying out deficiency repair works in the colonies and it is expected to be completed by August, MCG officials said. In the other five colonies — Sushant Lok 1, South City 1 and 2, Nirvana Country and Palam Vihar — the MCG is awaiting financial approval from the state government for commencing sewerage work, said Yadav. He added that it is expected to be approved next week. GURUGRAM: A spate of burglaries has caused apprehensions about safety in the Suncity township. On Saturday night, burglars broke into an apartment in the E Block. A few days ago, jewellery was stolen from an apartment in the F Block. In total, 25 cases have been reported from the township in 2018 and two, this year, with residents attributing the rise in crime to the mushrooming of over 100 shanty clusters in the vicinity of the township. MCG took over Suncity on Thursday, and the term of its current RWA will expire soon. After that, management and other affairs will be handed over to an ad hoc body, which was recently formed. Deepak, the Sector 53 SHO, said that FIRs had been registered in all the 27 cases and a team of police wasinvestigating them.